So if you haven’t already picked up your copy of The Little Bootcamp Book Of Workouts make sure. I’ve smashed your inbox enough this week so I won’t be making any more reminders. Get it. Let me start by saying thank you. Sorry, let me say that again. This week has been exhilarating, exhausting, fun, frantic and fantastic. And it is all thanks to you. 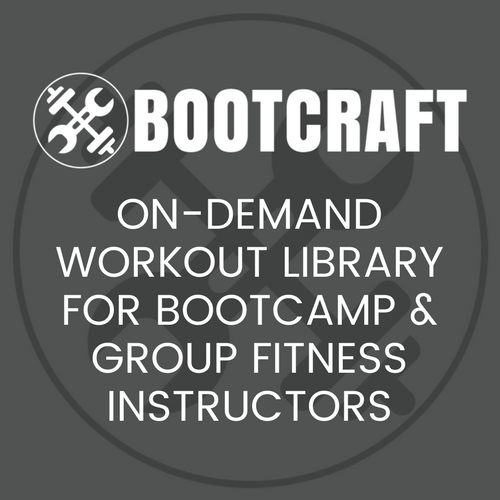 To all of those who bought a copy of The Little Bootcamp Book Of Workouts, I really hope you find it a useful tool for planning and creating your workouts. The book will continue to be available as an awesome starting point for new readers and instructors. To the rest of you, don’t worry I didn’t sell out. I will continue to provide excellent free workouts and ideas on the site as usual, plus finish organising a little Christmas present for you all. Some times when running a small bootcamp in can be hard to tell if what you are doing is working or not. Often you have to wait until the end of the year before you can really look back and analyse what you did. Launching a product to a large audience allowed me to see what practices I use in all my business endeavors that really work. Number 1: Let your audience come to you. Who do you think is more likely to sign up and stay with your bootcamp; a person who has found you online while searching for ‘bootcamp Chicago’ (let’s pretend you are in Chicago) or the person who just got one of your brochures in the mail, hidden underneath the pile of other junk mail. The fact is that you are always going to be able to sell much easier to someone who is actively searching for your solution compares to a person that you have to jump up and down in front of to get their attention. Stop trying to sell to people who don’t want to get fit, and start focusing on people who do. For example: This blog is called bootcampideas.com. I called it that specifically because I wanted to attract trainers looking for ideas and workouts for their bootcamp. How would they find it? By searching for bootcamp ideas in Google. I didn’t try to email trainers who were running bootcamps and try to convince them to come to my site. Instead I focused on delivering what I said I would, Ideas. And I started by just posting one workout a week, every week, consistently. I knew that if people found me on the internet and saw that, then they would probably want to stick around. If you do what you say you will and then do it consistently (eg. be fired up for your classes, always call clients who miss a session, always send out your newsletter), you will see an amazing change in your business. Get a website. What’s that? It’s too confusing to set one up? Ok, then hire a web developer and get a website! Think about it, where is the first place you go when you are looking for something, online right? Your customers are no different. You must have a website if you want to get serious about your business. 38% of my new clients this year found us by searching for bootcamps on the internet. If you don’t have a website, start doing something about it this weekend. Bonus points if you add an (active) blog and/or have a Facebook Page. Get signage on your vehicle If you don’t have a studio or home base that you work out of with good signage, you are missing out on exposure to people driving and walking by. Go price what it will cost to get some awesome signage on your car, you may be pleasantly surprised. There is a reason Step Into Life do this with all their franchisees, it works. Bonus points if you park it for a whole day once a week at the park you train your clients at. Do stuff for free. Answer emails to prospects and clients in as much detail as you can. Offer to donate bootcamps to your local school fete’s silent auction. Set up a stall at your local farmers market and answer questions for free. Run a free bootcamp session once a month for people to come over. Offer to help promote your client’s business or project in exchange for nothing. These actions will build trust, friendship and authority, all of which are priceless in your life and business. Bonus points if you already to this. We don’t make much money off our school holidays kids bootcamps. We do them because the kids love it. Notice also the parents chatting in the background. Number 2: Send that second email. I like to send two emails to promote each round of bootcamp I do. The first one is in newsletter format, it’s just a simple reminder that the next bootcamp is starting in a couple of weeks and that they should book in now. I usually include a recipe that I like at the time and/or a simple home workout. By including this I feel there is something for inactive members to enjoy and it’s also a good way for me to say ‘Thanks’ for letting me email them. The second email I send is usually around the Thursday before the next bootcamp. This is more like ‘Don’t forget to sign up!’ at which point a few more stragglers come through. I have never seen the power of the second email though until I launched my ebook this week. For the first 24 hours the book was discounted 52% as a thank you to my long time readers. During the last 30 minutes of this special launch deal, I sent out a quick reminder email about the price going up. In the next 30 minutes, an influx of 22 sales went through. You do the math, not bad for an email that only took a few minutes to write (of course that’s not including the 2+ years it’s taken to build this site and the email list that that email when to). So, while your email list might be much smaller then the one for Bootcamp Ideas, that second email might be the difference between a couple more bootcampers signing up and them not. What are two bootcampers worth to you? Some new equipment? Money to hire a new trainer and start some more time slots? Just whatever you do, don’t make that second email too pushy. A friendly reminder will usually suffice. Number 3: Early bird deals. Continuing on from the last tip, setting a special early bird rate for people who book and pay 3+ weeks in advance will help with your cash flow and efficiency as you will have less clients to chase up for payments if they are paying up front. Another way to do this to a similar effect is to offer a discount for signing up for 3 bootcamps at a time. That is the method I use every Winter to lock people in for the cold months. Be careful with discounting your products though, you still want to make sure you are getting paid for your time and effort. Build relationships aka. Customer Service. Your view on customer service should not be limited to when something goes wrong. And when something does go wrong, you should not stop at fixing the problem but instead aim to create a positive experience for your customer out of that problem. Doing this is so much easier if you have built a relationship with your client beforehand. Before I go into how this negative situation to positive situation tactic works in your bootcamps, I’ll give you an example of how my book launch taught me this lesson. I was lucky enough to be warned in advance that something would go wrong with my first book launch. I sat tentatively on my chair after sending out the launch email, waiting for the first support emails to come through. There was indeed a problem. A small but crucial problem. After payment was made via Paypal, the customer was returned to the site. On the return page there was a small, unobtrusive button that said Complete Order. Most people, being normal web savvy people, assumed that after a payment was made you could pretty much close your browser and check your email later to pick up your book. If that little button wasn’t clicked, the software didn’t register the payment and the customer was unable to access the download links. It was bad. I expected a torrent of pissed off emails accusing me a of a scam and demanding a refund. But what I ended up getting was polite, supportive emails from buyers just wondering where their download links were and would I mind giving them a hand. Why were the emails so understanding? Because I make a real effort to show that there is a human being behind Bootcamp Ideas, not some faceless cooperation I answer all of the email I get, I try to reply to all of the questions on Facebook, I try to promote community with competitions and I try to include some personal details in workout commentary. I don’t say that to try and toot my own horn, I just want you to understand how putting in the time to build a relationship in the first place is the best kind of customer service you can do. If you can do this with your clients, you will be able to turn a bad experience into a good one ( and hopefully gain a new raving fan) much easier. Here are some suggestions on how to give awesome customer service. Let’s call them the “three Be’s”. Be proactive. Call or text your clients once and a while to see how they enjoyed a session. Don’t wait for them to quit before you go after them. I have more coming on this topic another post soon. Be flexible. Yes, have some policies (refunds, missed sessions etc) in place, even have your clients sign something when they start. But realise that each case is different, each person is different. Ask lots of questions and try to empathize with them so that you can come to a solution. Even if you lose money over the solution, you will gain positive referrals and praise for being understanding, a rare quality in today’s businesses. Be approachable. Make it easy to get in contact with you, give you number and email to every new client and actually tell them to contact you if they have any problems. Along with that, always respond quickly when they do contact you. Make a connection with your clients. You probably saw some themes arising in the article above. Good, hopefully that shows that the tips I’m giving are simple and easy to implement. Be easy to find and let your clients come to you. Send that extra email. Be nice about it, not spammy. Build relationships, not just clients. If you just focus on doing these three things for the rest of the year, I’m sure you will see some great improvements to your bootcamp and your enjoyment in running your bootcamp. Linked into the emailing and website tips is the ability to write interesting content. I come from a science and engineering background so my writing skills are limited to reports on embedded microcontrollers. However, in person I like to think I am a fun guy so I try to capture that in my writing (although I’m not sure the joke always comes through). Why should you learn to write well? So that people read your stuff. There is no point putting hours of time and effort into blog post, articles or newsletters if none of your clients are reading them. Make them interesting, to the point and add in a dash of your personality. Try to not to write like a text book (like I used to and often still find myself doing). If you are interesting in improving this skill – as it is an awesome skill to have – some resources I recommend are the Copyblogger Blog for compelling writing in your emails (check out the tutorials in the side bar) and Think Traffic for the website side of things. Both sites are free. For two very different examples of great writing to a fitness audience check out Jason Ferruggia and ‘Roman’ Romaniello. Regardless of what you think of their training methods, they both write very interesting and enjoyable content for their market. If you enjoyed this post, great, I did too. Sign up to our mailing list to get more essays like this plus all of our new workouts and ideas. If you are new here you might like to start with the book, The Little Bootcamp Book Of Workouts. Congratulations Kyle for the launch and thanks for sharing your great insights. Cheers!